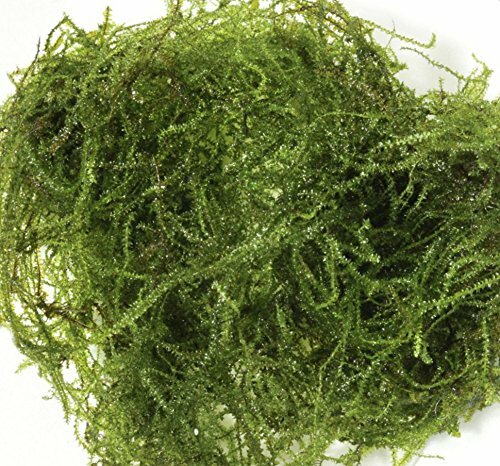 Christmas moss or Xmas Moss (Vesicularia montagnei) – is an aquarium plant which together with Java moss makes the most widespread mosses in aquarium husbandry. Christmas moss got its name due to the fact that its preformed shoots hang down and overlap each other like fir-tree branches and the moss itself resembles a fir-tree shape as well. However, green color of this moss is much brighter and lighter, than that of Java moss. At the same time Christmas moss that grew provided with poor conditions (low illumination level, absence of CО2 and fertilizers, hard water, seldom water renews) is not that branchy and due to this it is very difficult to distinguish it from Java moss. In the wild this moss grows on humid and shadowed river and pond banks as well as in some forest areas with high humidity level. There are no exact borders of this kind of moss natural habitat, apparently they don’t exist; but more often you may encounter its original kind in waters of India. However, it also inhabits in China, Japan and some areas of South-East Asia. The moss bush sticks to a substrate as well as to various objects: drowned tree boles, branches, snags and even stones. The plant prefers warm streaming water and grows successfully as a colony (a bush) only in a clean environment. In muddy water it just won’t survive and if the moss habitat suddenly gets polluted, it dies. According to the scientific classification this representative of aquatic flora is from Bryida subclass, Hypnaceae family, Vesicularia kind. Latin name of the kind is Vesicularia montagnei, which means “crying moss” in Latin. In general, Christmas moss like other aquarium mosses is not demanding. However, any abrupt change of water parameters, for example, variations of general water hardness during careless water renews may cause stress and growth rate of the moss will slow down. Quite often Xmas moss is mistaken for a widespread Java moss. Sure, at first glance they are very much alike. Each shoot of Xmas moss has tiny sprouts that grow symmetrically from the branch stem. Size of these shoots gets smaller towards the thallome top and this shape resembles a triangle or a fir-tree shape. This is where the moss name came from. When its branches grow to reach some certain length, they bend under their own weight like those of a weeping willow. To be fair, we should mention that such a structure is peculiar not only to Vesicularia montagnei kind, however people started to call this moss a Xmas one only due to its wide occurrence in aquascaping. It seems that it’s just not the time yet for other similar mosses to be used to create decorative effect in tanks. This moss is considered to be the easy one to keep. Really, it is completely undemanding and it can successfully grow at room temperature, it can vary from +18 to +26°C. Water hardness and its pH doesn’t play any significant role here, but yet it’s better to stick to average values of these parameters in a tank. As for illumination, its power and intensity should be selected taking into account comfortable existence of other tank dwellers, since it’s not of crucial importance for the moss. It was noticed, that the moss becomes a bit more bushy at low illumination intensity. However, you will have to constantly monitor the purity of tank water. Xmas moss can’t grow in muddy ditch water, that’s why it requires high-efficient purification system and creating some water flow. As other similar plants Xmas accumulates organic remnants in its bushes, some microorganisms develop there as a result as well as various small spineless species and thread algae. If you don’t clean (siphonage) tank vegetation occasionally, it will undergo degradation in time. Except this compulsive weekly ‘overall cleaning’ experienced aquarists also use some natural ways of preserving the moss in good condition. Cherry shrimps are very helpful in this respect. If you keep them in your tank, they won’t just live in the moss bushes, they will also clean their ‘home’ from algae and other rubbish. Such a neighborhood makes quite mutually beneficial and natural co-operation after all. Live Aquarium Plants : Chrismass Moss 1 Cup. Difficulty - Easy ready to grow! | Light - Low-High | Growth - Slow. Second photo is not actual plant but is a sample of our stock. This aquarium moss grows rather fast. That’s why to maintain an aquascape composition you should cut the moss from time to time. Otherwise, because of lack of light in the bottom moss layers they may start to rot and fall off a stone or a snag. Cut the whole upper layer. After this the moss will grow many small and short brunches and they will make a fluffy hillock. Cut the moss brunches selectively and leave the most branchy shoots. After such a cut the moss will grow ‘hanging’ hillocks. When cutting the moss especially using the 1st way, try remove the cropped moss brunches from the tank right after this; at the same time you can perform water renew and siphonage the rest of the moss bush. Otherwise, the cut moss brunches will spread all over the tank and you will get the moss bushes growing where you didn’t plan to have them in your aquascape.